The question remains: What factors led an undisciplined, unprepared, divided American nation to prevail over the world's largest empire? Despite the supremacy of the British navy in the 18th century, the Colonial naval forces won many battles. This picture depicts the naval engagement of July 7, 1777, between the American frigates Hancock, Boston, and HMS Fox, and the British frigates Flora and Rainbow. Britain's military was the best in the world. Their soldiers were well equipped, well disciplined, well paid, and well fed. The British navy dominated the seas. Funds were much more easily raised by the Empire than by the Continental Congress. Some of those funds were used to hire Hessian mercenaries to fight the Americans. The Americans had tremendous difficulty raising enough funds to purchase basic supplies for their troops, including shoes and blankets. The British had a winning tradition. Around one in five Americans openly favored the Crown, with about half of the population hoping to avoid the conflict altogether. Most Indian tribes sided with Britain, who promised protection of tribal lands. Although American troops may not have had the military force and economic base that their British rivals had, they did believe strongly in their fight for freedom and liberty. 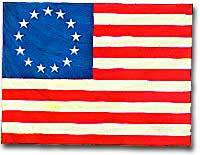 The Continental Congress adopted this "Stars and Stripes" as its official flag on June 14, 1777. On the other hand, the Americans had many intangible advantages. The British fought a war far from home. Military orders, troops, and supplies sometimes took months to reach their destinations. The British had an extremely difficult objective. They had to persuade the Americans to give up their claims of independence. 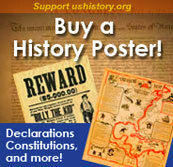 As long as the war continued, the colonists' claim continued to gain validity. The geographic vastness of the colonies proved a hindrance to the British effort. Despite occupying every major city, the British remained as at a disadvantage. Americans had a grand cause: fighting for their rights, their independence and their liberty. This cause is much more just than waging a war to deny independence. American military and political leaders were inexperienced, but proved surprisingly competent. The war was expensive and the British population debated its necessity. In Parliament, there were many American sympathizers. Finally, the alliance with the French gave Americans courage and a tangible threat that tipped the scales in America's favor. American Revolution gave birth to many songs, but none gained the widespread notoriety that "Yankee Doodle" did. Originally composed by the British to mock the colonial forces, the song became popular with Americans after their victory — the ultimate tongue-out, thumbs-in-ears-with-fingers-waving anthem for a proud, young nation. Read about the song's history at this site, part of PBS's online companion to "Liberty! The American Revolution." Spend some quality time at this Sons of the Revolution in California website and uncover some interesting facts and figures of the American Revolution. Although it doesn't reveal the strengths and weaknesses of either side, the site does go into great detail on many other aspects of the war. The best place to start is the "Battles" link. Clicking on any year in the chronology brings up a complete list of the battles of that year and the dates they took place. The "Casualties of the Revolutionary War" link (also under the "Battles" link) provides a detailed list of the dead and wounded from both the American and British forces. And all this is only one link! Other links include "Flag History" and "Colonial Uniforms." Forget about strengths and weaknesses! Which side was the best dressed? Are you a jaunty or a daddy? Do you sit in the cad's corner and dodge Pompey? Read more about British naval slang and terms in 1775 to find out. The Continental Navy had only 31 ships when the Colonies declared their independence from Britain in 1776.